File carving is the process of reassembling computer files from fragments in the absence of filesystem metadata. Wikipedia. “File carving”, literalmente tallado de archivos aunque lo traduciremos como extracción, es el proceso de re-ensamblado de archivos extraídos de un conjunto de mayor tamaño. Footer: Don’t have footer, but size is in bytes 2,3,4,5 in little-endian order (low byte first). 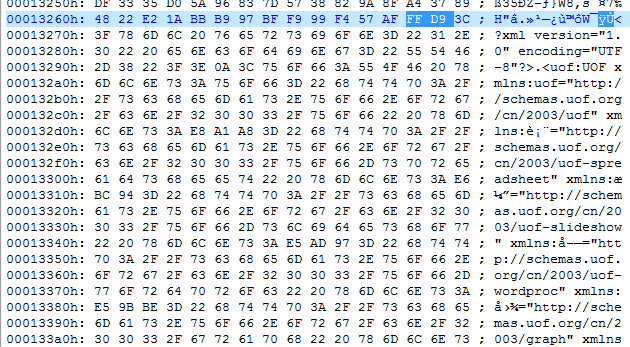 All this documents have the same header and footer, because of this, we need search the middle bytes. This type uses a ZIP file package. Los documentos de Microsoft Office >2007 tienen la misma cabecera y pie, por lo que necesitamos bytes intermedios para distinguirlos. Usan encapsulado ZIP. Footer: 50 4B 05 06 (PK..) followed by 18 additional bytes at the end of the file. All this documents have the same header and footer, because of this, we need some bytes to differentiate them. In this case we can do this jumping 73 bytes from header. This type uses a ZIP file package. Los documentos de OpenOffice tienen la misma cabecera y pie, por lo que necesitamos bytes intermedios para distinguirlos. Usan encapsulado ZIP. Footer: 6D 61 6E 69 66 65 73 74 2E 78 6D 6C 50 4B 05 06 (manifest.xmlPK) followed by 18 additional bytes. Tail: 6D 61 6E 69 66 65 73 74 2E 78 6D 6C 50 4B 05 06 (manifest.xmlPK) followed by 18 additional bytes. Note: >2007 versions have two patterns and the key is the position 0x80. If in this position we get the bytes “68 40 F8 F7 92”, we need to search again for this bytes and displace 107 bytes to find the end of the file. If in the position 0x80 we get another different bytes, we need to search again this bytes and displace 1024 bytes to find the end of the file. Nota: Las versiones >2007 siguen dos patrones y la clave está en la posición 0x80. Si en la posicion 0x80 obtenemos los bytes “68 40 F8 F7 92”, los buscamos una segunda vez y ha 107 bytes encontramos el final del archivo. Si en la posición 0x80 obtenemos otros bytes diferentes a los del primer caso, los volvemos a buscar y a 1024 bytes hallaremos el final del archivo. Footer: 01 15 06 01 00 20 followed by 5 additional bytes at the end of the file.